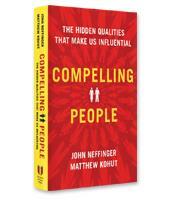 What makes some people irresistible and others forgettable? John Neffinger and Matthew Kohut introduce us to two qualities –– strength (the root of respect) and warmth (the root of affection) –– and they detail the signals that broadcast each of these. Drawing on the latest social science and the authors’ own work, Compelling People reveals the basic framework we use to judge each other and what we can do to earn both respect and affection. The dynamics that make it tricky to project both strength and warmth at once. Which factors we have control over and which ones we don't. Nonverbal cues that broadcast strength or warmth. How to use language to connect and then to lead in conversation and writing.